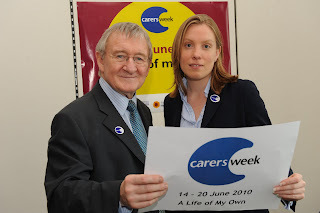 Encouraged by a recent meeting with ITV's This Morning celebrity GP, Dr Chris Steele, I visited the Medway Carers Centre yesterday in support of Carers Week (14-20 June) to celebrate the contribution made by people across Medway who provide unpaid care for someone who is ill, frail or disabled. There are a shocking 21,000 carers across Medway, many of whom are children, who sacrifice much of their own lives to look after others and are unable to do the little things that most of us take for granted. A trip to the cinema or even a full night's sleep are luxuries for thousands of people across Chatham & Aylesford and we more often than not forget this. Visiting the centre yesterday was an important initiation for me on this issue and I felt very humble afterwards. I popped into a caring with confidence class that the Centre runs and instead of just saying hi briefly, we ended up having an impromptu Q&A session. This was followed by a more formal meeting with carers and volunteers at the Centre. Both parts of the visit raised some very good points about policy changes or improvements and I look forward to taking them up with the relevant ministers.